All Games > Indie Games > Frog Out! Frog Out! is a wacky local multiplayer party game for up to 4 players. It's time for you and your friends to find out who is the slickest and the craftiest frog in the pond. Channel your inner frog and jump to victory! Notice: Frog Out! requires a controller in order to play. Skins added to the game. You can now customize your frog before you enter the arena. Major optimization improvements. Game should now run much better on all devices. Round animations, score animations and general UX improvements. Menu system revamped to be more streamlined. Fixed sound effects volume being louder than intended. Who is the slickest and the craftiest frog in the pond? That is for you and your friends to decide! Frog Out! is a wacky local multiplayer party game where you face your friends in the most curious of situations. Every frog for themselves! Jump, dodge, eat, spit and generally just frog around your way to victory in this awarded family-friendly experience. Up to 4 players supported. Since it's a party game, make sure you have at least one friend with you! Easy-to-learn, frog like controls - Take control of your frog and jump around to dodge hazardous obstacles, including other frogs! Capture your opponents into your mouth with your springy tongue and toss them into danger or out of the arena. 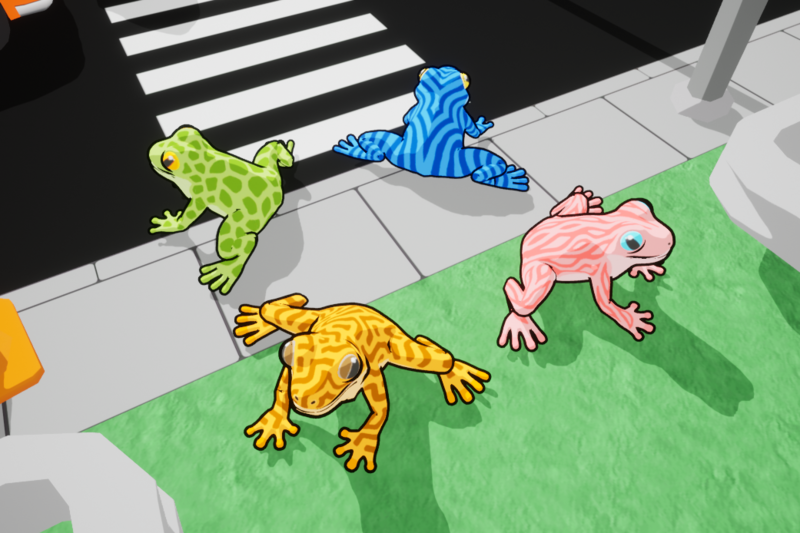 3 exciting game modes - Claim the lily pad for your own, be the last frog to survive a series of deadly stamps or try to cross a busy series of streets while sabotaging your friends! More to be added in the near future.